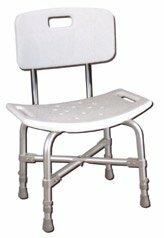 Deluxe Heavy Duty Bath Bench With Back features extra strength aluminum used to accommodate individuals up to 500 lbs. Cross brace attached with aircraft type rivets. Blow molded bench provides comfort and strength. Drainage holes in seat reduce slipping. Adjustable height legs. Aluminum frame is lightweight, durable and corrosion proof. Limited Lifetime Warranty.